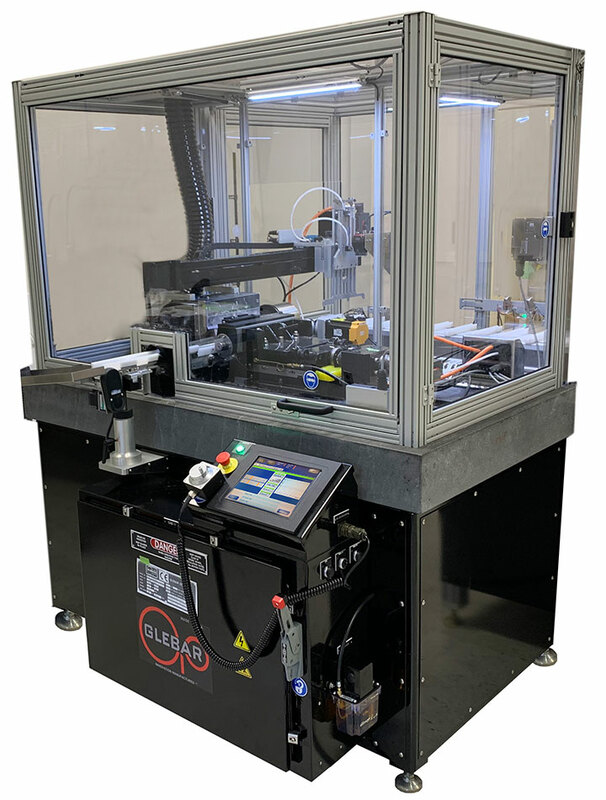 Glebar was able to design and build a fully automated system for the customer by configuring a PG-9DHD Infeed Centerless Grinder with a six-axis robot and discreet conveyor. 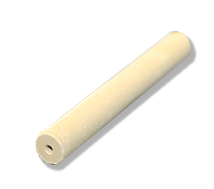 The system was able to hold the required tolerance of +/- 0.001in and remove ~0.040in of stock (0.020in per side). The system can run multiple-part per cycle, grinding 2 parts at a time at a rate of 2 parts per 6 seconds, keeping time with the press cycle. First, the engineers built a mockup of an isostatic press to replicate one the customer had purchased separately. An integrated six-axis robot, driven by Glebar’s custom designed software, picks up 6 parts at a time from the press. As it does this, it performs two functions. The robot initially senses and confirms the part is in one piece and present in the fingers, then, it recognizes the presence of the bottom half of the part, to ensure they did not snap or break apart. The robot then moves the parts and places them onto a cleated conveyor. As the conveyor indexes the parts, the robot returns to the press to lift and move a secondary set of 6 more pieces onto the staging area while the previous set is being transported towards the grinding area. Prior to entering the grinding area, the parts pass through a camera station to check the parts are defect free. Upon completion of inspection, the gantry head slides the parts into the grinding area for centerless grinding. The parts are inserted 2 at a time. As the parts are complete, they are pushed out to the bin and simultaneously, two new parts are staged to be ground.